THIS week at Goodwood, Sussex home of Rolls Royce Motor Cars and of the Bespoke Collective of the manufacturer, saw the reveal of the ADAMAS collection. A limited-edition Black Badge collection of 40 Wraiths and 30 Dawns. Drawing its inspiration from the name the Collective celebrate the darker side; weaving a melancholic aesthetic of carbon structures into just 40 Black Badge ‘Wraiths’ and 30 Black Badge ‘Dawns’. Carbon fibres and compounds of carbon crafted to express a mesmeric sinister lustrous beauty. Stepping inside the cars one’s eye is drawn to the clock, encrusted with black diamonds and the symbol of Infinity. Eighty-eight laboratory-grown diamonds , carbon in its most adamantine form. Mounted on a carbon fibre back plate the black diamonds are perfectly engineered to deliver clarity and colour. The face of the clock is embellished with machined aluminium chaplets and a polished aluminium bezel, adding drama to a contrasting white face. One of the most dramatic explorations of the diamond carbon theme is the starlight headliner of the Wraith Adamas, 1,340 individual carbon fibre optic lights are arranged as though forming the molecular structure of carbon as it becomes a diamond. A motif that runs as a spine through the interior of the cabin. The exteriors of the Adamas Dawn and the Adamas Wraith draw their inspiration from the original interiors colour schemes of Mandarin Orange and Cobalto Blue transformed and darkened into sinister and hypnotic iridescent hues. Select customers may specify either hue for their Black Badge Adamas. The Rolls Royce grill vanes do not elude the Black Badge treatment being black. Nor yet the Spirit of Ecstasy who finds herself formed for the first time in her history machined from carbon fibre then fixed to a titanium base vapour blasted to a darkened aesthetic and bearing the words BLACK BADGE ADAMAS and the Infinity Logo. Limited in number, rare in spirit, untamed in nature, invincible in character the Black Badge Adamas is clearly aimed at the celebration of the edgier side of luxury automotive craftsmanship. 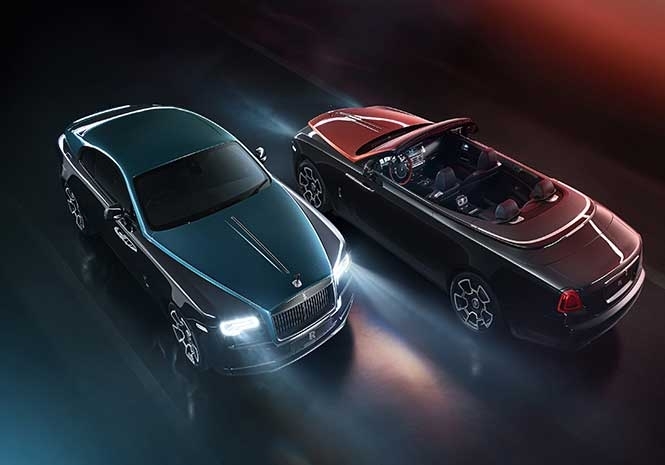 Prices have not yet been specified, but with the ‘standard’ Wraith Black Badge starting at €327,000, the sky is the limit.